Johann Elias Ridinger (Ulm 1698 – Augsburg 1767). The Pursued Stags. 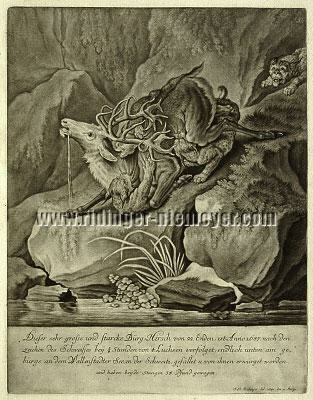 For once a mountain stag of 22 points by four lynxes, for the other one of 10 points by hounds. Above the bank of Lake Walenstadt in the canton St. Gallen and before the fall into the same. Set of 2 sheet. Mezzotints. Inscribed: J. El. Ridinger del: 1741. den 11. Martji and Joh. Elias Ridinger inv: del. et excud. A. V. 1741 resp., otherwise as below. 14 × 10⅞ in (35.4 × 27.5-27.6 cm). Thienemann 1145 ( “A very beautiful and rare sheet”, 1856) + 1146; Schwarz 1145-1146; Weigel XXVIII, Ridinger 75 a/b; Silesian Ridinger collection at Boerner XXXIX, 1984 (only sheet 2 + “extremely rare”, 1885! ); Reich auf Biehla 220/21 ( “Very rare”, 1894 ); Helbing XXXIV, 1500 ( sheet 2 only, the afore-mentioned of 1885? + “Very rare sheet”, 1900 ); Schwerdt III, 148 (“A fine set”, 1928); Counts Faber-Castell 76 (one trimmed to the edge of the subject; 1958). Neither in Coppenrath (1889/90) , Gg. Hamminger (1895) , Schoeller (1921) collections nor in listing Rosenthal (1940) and the Ridinger exhibition catalogues 1967 + 1997 ff. 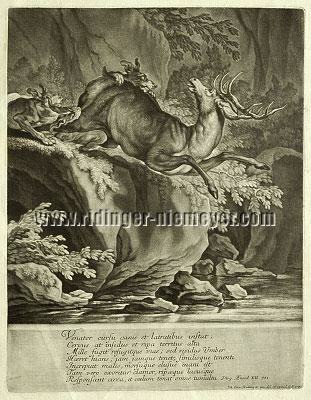 The very rare pendants of the pursued Swiss stags in very fine and with 17⅞-18⅜ × 12⅜-13¼ in (45.5-46.8 × 31.5-33.5 cm) sheet size (Schwerdt copy: 17¾-18⅛ × 14 in [45-46 × 35.4-35.5]) enviably wide-margined impressions as both frequently already technically that far out of reach for the collector of the delicate velvety old mezzotints as – so the expert von Sandrart 1675 – the mezzotint plates (allow for) about “50 or 60 clean impressions only. Afterwards, however, (the image) grinds off soon as it does not go deep into the copper”. Sheet 1 with faint tidemark in the left white lateral margin. Sheet 2 first with original fine diagonal box pleat from upper right till center, then later squeezes noticeable on the back which appear also on the front in the lower text field left and in the center, but neither the former nor the latter more considerably impairing the very fine picture impression. Light trace of dirt moreover in the right white lateral margin and on the back above.